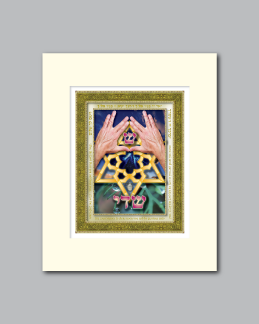 Jewish Rituals :: "As Above So Below"
The inspiration for this art piece comes from the mystical and sacred “Birchat Kohanim” or “Priestly Blessing” said at pivotal times during the Jewish year. The “Kohanim” (those descended from the Temple priests of ancient days), raise their hands and become the conduits for blessings from G-d to be bestowed over the congregation. 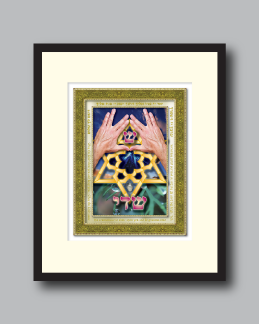 The upper portion of the art piece illustrates the hands of the Kohanim as they raise them to receive divine blessings. 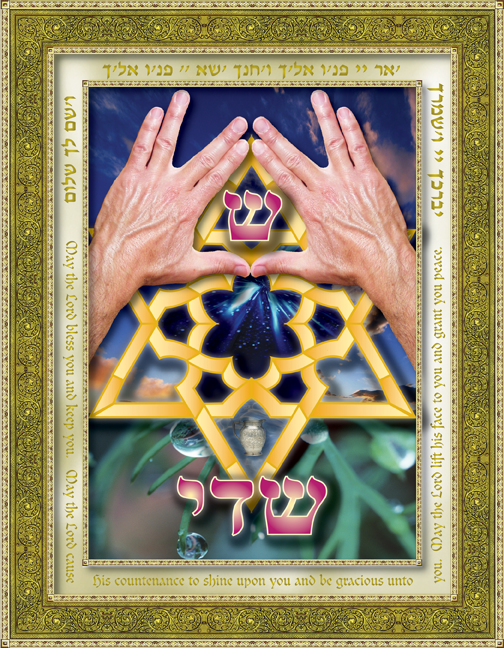 The hands create the Hebrew letter “shin”, which is portrayed at the top of a golden Mogen David (Star of David). Behind the hands is the twilight sky, evoking a majestic view as we look upwards to the heavens. Within the center window of the shining Mogen David, the miraculous force of G-d is symbolized. At the bottom, the lush green vegetation of our physical, mental, emotional and spiritual lives is portrayed. Here, we receive and are fed by the blessings that “rain” down upon us by our Creator. Surrounding the image are the words, in Hebrew and English, divinely inspired and then spoken by the Kohanim. The Hebrew word “Shaddai” (a sacred word for G-d), is featured at the bottom of the Mogen David. This reminds us that when we live a life of mindful spirituality and reverence, Hashem is with us in each moment of our daily lives.